The Fashion Star awards went to Joseph Altuzarra, Sarah Burton, Peter Copping and Brunello Cucinelli. And the night’s other honorees were Elie Tahari, Roger Schmid, William Sofield, Carol Hamilton, Caroline McCall, Tom Kennedy, Lisa Paulsen and Glenda Bailey. 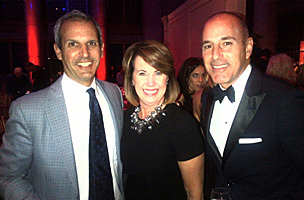 Also in attendance was Katie Couric and her husband John Molner, Matt Lauer as well as our own Lunch columnist, Diane Clehane, who’s been on the event’s planning committee for the past 20 years.